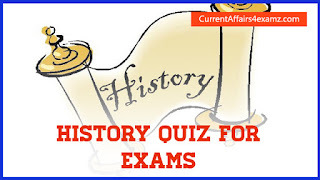 Hi Aspirants, in this post we share with you some repeatedly asked History Questions in SSC CGL and SSC CHSL Exams. This will be very useful in you preparation. Click on the start quiz button to attempt the quiz in online mode and check you score. 1. Who built the Grand Trunk Road? 2. How many days did the battle of Mahabharata last? 3. Who built the Agra Fort? 4. Name the famous battle that Rana Pratap fought against Akbar's forces. 5. Who built the Red Fort in Delhi? 6. Where is the Deer Park where Buddha first preached his religion? 7. Which king had Chanakya as his minister? 8. Which of Akbar's uncles served as his guardian and won the Delhi throne for Akbar? 9. Who built the famous Sanchi stupa? 10. Who was the last ruler of the Mughal dynasty?